NACTO supports a future transportation system that provides a sustainable, accessible, and affordable backbone to the strong cities at the center of our 21st century economy. New technology has the capacity to reduce the footprint of vehicular travel, moving more people in new forms of medium and low density transit, while creating space for safe and inviting walking and cycling infrastructure. Positioning new mobility services to provide access and mobility to all, and to buttress rather than undermine the successful transit lines at the heart of our cities, is vital to realizing the value of fully automated vehicles for mobility. 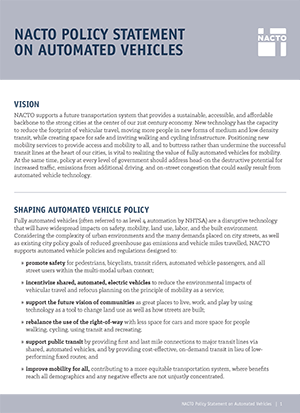 At the same time, policy at every level of government should address head-on the destructive potential for increased traffic, emissions from additional driving, and on-street congestion that could easily result from automated vehicle technology.